I have been a fan of Duran Duran for more than 25 years and while performing surgeries I listen to various kinds of music and because of the young members of my team my genereal awareness of the current music bussiness is good. Moreover I am interested in music and the fact that I have been cooperating with Interkoncert – LiveNation since 1998 and so had the opportunity to take care of various artists as their doctor during their stay in the Czech Republic, /in case of bigger events in Slovakia as well / should not be omitted either. Thanks to this, I have already got to see more than 150 concerts and that is why I dare to express my opinion. The voice of Bono Vox hasn´t been „ a Good Voice“ for a long time, their records since Joshua Tree have been rather unconvincing and it is quite difficult to find 2 or 3 song on each of their new albums which could have the „HIT“ potential... but still they manage to sell out big arenas… Their rhytmics is great and have a charismatic quitar player. But would U2 still be the same band even without one of their members ? Dave Gahan for himself is an interesting topic to discuss...his dedicated fans are able to sing along all the refrains for him and still are entusiastic about his singing skills. But to say the truth, Dave Gahan doesn ´t almost sing at all...Charismatic Martin Gore is more of all a „cartoon character“ and more that 80% of the concerts are pre-recorded. The Queen without Freddie are a professional band but for most of the public they are just a legend....or do you know any song by Queen after Freddie´s death ? Then why are Duran Duran less popular that these stars ?When their fame was reaching the stars during the 80´ they split up... in other words of the avarage pop music fan they disappeared....stopped existing....Their comebacks with Notorious, Big Thing or Liberty were noticed just by their dedicated fans....Though these recordings were acclaimed by the critics, in this so quickly changing world of „fast food“ consumed music there is no more space for „girl idols“ from the 80´. And when the Ordinary World and their partial comeback came, a downswing impossible to understand followed. And honestly, who of usu were excited about Pop Trash? When I had the chance to see the original line up of the DD in Wembley during Easter 2004, it was surely not just me who told to himself: yes, they are back. Such a great rock band! Their characteristic sound, the singer with a flawless voice, perfect rhytmics, fantastic quitar...all of the qualities which are necessary for our favourite band to became a world legend, which they had already been headed to in the 80´. And Astronaut is definitely an album the DD needed. When I saw them one year later in Prague and I even had the chance to talk to them they seemed to me like „ordinary guys“. One year after that in Bratislava, things were totally different...This was the second concert without Andy and questions aboutr him at the backstage were banned. And Andy´s quitar at the concert was terribly missing....As well as on the RCM and has been missed since. Dom Brown is neither Warren nor Andy Taylor which was made obviously clear above all on the „ Ordinary World“ ...A rock band without a decent guitar player just can not exist. If the DD chose for the AYNIN the“ return to the roots“ and a single producer, they made exactly what Andy had wanted during the recordings for RCM, as he is writting in his book which was released much longer before AYNIN...There is no reason not to believe him. Yes, we don´t know what really happened, but I am afraid that untill the „fab 5“ meet in Andy´s study in Ibiza, Duran Duran will remain being a group for 5000 nostalgic fans. And that is why despite their professional performance, the wide public will still view DD as a relic from the 80´ and they will keep on playing Rio, Girls and Film, Wild Boys etc… . It is obvious that the „set list“ played by a quartet in stead of the original line up for 5, is not the only but, still a big problem. Likewise as in the Astronaut tour the current schema remained similar: Cca 5 new songs and same old hits....with a set list like this Duran Duran will really sooner or later get to „ Lucerna Music Bar“ or a different music bar for about 1 000 people who will be willing to listen to the same songs all the time. This is the way to get conserved as the last century relic and not to become a legend (which would be deserved). 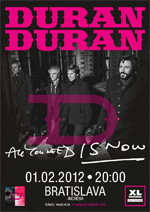 Nevertheless, the DD would have many recordings to choose from: At this point we are not talking just about songs which would be put on the TOP set list by other groups, but Duran Duran can and should be choosing, equally from their side projects too – Arcadia, Power Station or solo work by Andy and John (unfortunately I can not imagine any recordings from Nick´s Dark Circles project to be played during the concert…J ). To conclude, what would I like to hear next time ?